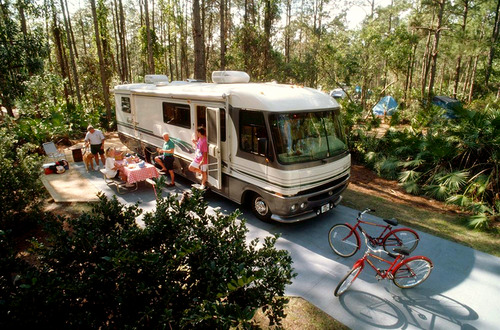 The most under-used assets owned by Americans are recreational vehicles (motorhomes, travel trailers, 5th wheels, pop-up campers, toy haulers). If you’re one of the millions who own one of these you can make money renting it to others. Hence, don’t let it just sit around gathering dust and growing cobwebs. You can make extra cash with only a little effort. The phenomenon of sharing assets or the “peer-to-peer marketplace” is best reviewed in a 2013 article in The Economist, The Rise of the Sharing Economy. One of the stunning opening stats is “Last night there were 40,000 people renting rooms from private individuals,” and this was in 2013! Millions of people are enjoying renting space from private individuals instead of going through the hassles that come with booking hotel rooms and being slammed with the never-ending fees. You’ve experienced this frustration, right? Self-parking fee. Valet parking fee + tip. Wifi fee. Resort Fee. Hotel service fee. Per person fee. Booking fee. Athletic club fee. Facility fee. It’s time to say no to the fees. That’s why the so many people are looking and booking other types of travel and vacation rentals, because the market is HOT! If you have a travel trailer that you don’t use 100% of the time, now is the time to rent it to others. Stonebridge RV Park is proud to partner with Easy RV, the hottest, newest RV and trailer rental platform on the web. Included here are steps that will help you you get your RV listed online and viewed by potential renters. First of all, you’ll want to click on sign-up and create a profile, because renters are going to want to know a little about you. Next you’ll click on List Your RV and follow the prompts. Keep in mind the more information you provide, the more interest you will see in your rental. Come up with a catchy name that will draw attention. Similarly, create a description that forms a nice visual in the mind of the anyone who reads your listing. Most important, is the last step of adding photos of your RV or trailer. Both interior and exterior photos will need to be taken & uploaded, therefore, you’ll want to put some thought & effort into creating just the right ambiance. Staging your photos will make your rental look inviting, and likewise, proper lighting is key to good pictures. Park it somewhere that has nice surroundings. For exterior pictures, set up chairs, a table, maybe a BBQ grill or hammock. Extend the awning. Bring out a plant or two and other items that you think look natural and inviting so you’re setting a scene that will attract renters. If you have family or friends that will serve as models include them in some of the pictures. Staging the interior is just as important, therefore, you’ll want to use nice bedspreads or blankets on the beds and pretty throw pillows. Set the scene with a board game on the table and colorful items on the counters. By creating a romantic table with pretty plates, flowers and a bottle of wine, you’ll show renters how versatile the space is. Once you have your photos uploaded, the last step is to add an account for your rental income deposits. Then your listing will be live and visible to renters. Need assistance with your listing? Do you have questions about renting your RV or trailer? Our support team can help, click on the chat button in the lower right corner of the site. Good luck!